Every year, I like to host my own version of the Twelve Days of Christmas, decorated cookie style. And just like the Second Annual Twelve Days of Giving with Lila Loa and Sugarbelle, I am running behind. 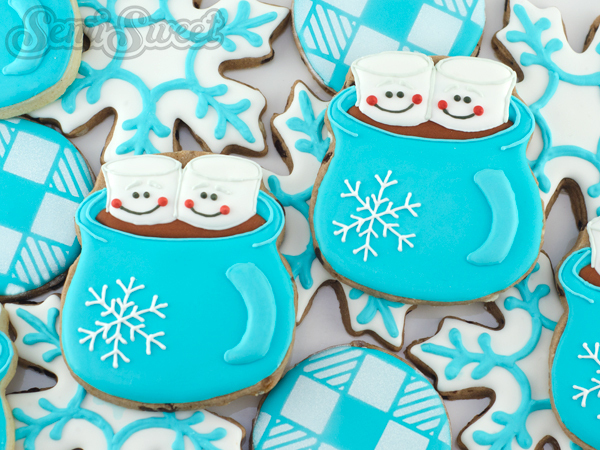 My one and only New Year’s resolution for 2016 will be to get and stay ahead, but in the meantime, here’s the first of my holiday guest, Mike, the brilliant brain behind Semi Sweet, with these adorable hot chocolate mug cookies! Hi, everyone! I’m Mike and I blog about cookies over at Semi Sweet. Thank you, Callye, for inviting me back again this holiday season! So happy to be here! After getting my fill of pumpkin spice lattes during the fall season, I’ve moved on. There’s another drink I’m looking forward to for the upcoming wintery months– a big ol’ mug of spiked eggnog hot chocolate with marshmallows! That’s where I grabbed my inspiration for these cookies. Let me show you how you can recreated them! 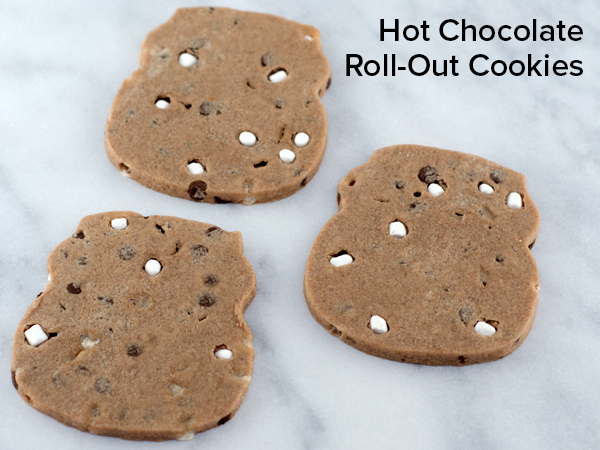 To make these hot chocolate mug cookies, I used this Comfort Grip skull cookie cutter from Wilton. Just trim off the top (as shown below) with a large round cookie cutter or a knife. Feel free to use your favorite sugar cookie recipe. 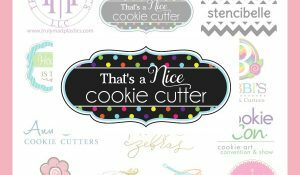 Or, if you would like the flavor of the cookie to match this design, I just posted a new hot chocolate roll-out cookie recipe you are welcome to try. That recipe has tiny morsels of chocolate chips and marshmallow bits that add a fun twist to the typical roll-out dough recipe. However, it is a little visually distracting for a tutorial. 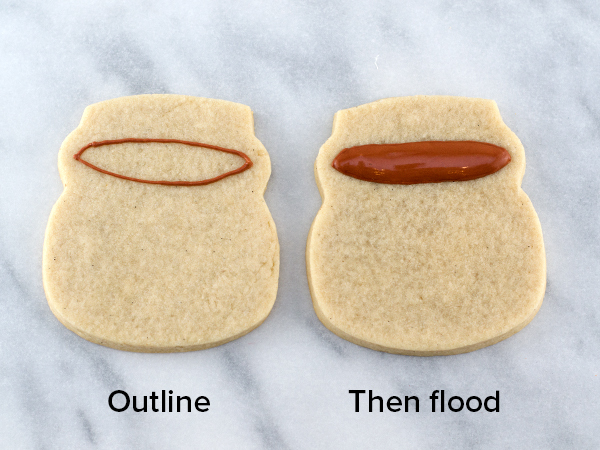 So for this how-to, I demonstrated on my regular sugar cookie recipe to keep things simple. To help with the decorating process, I provided a template of this design. 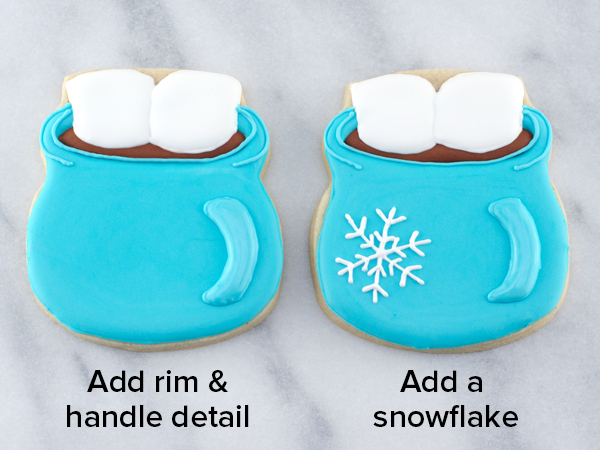 You can download the hot chocolate mug cookie template HERE. If you have a Kopykake or Pico projector, just print it out (or pull it up on your mobile device) and you are good to go. For those without a projector, follow the suggested steps below by tracing the design onto the cookie with an edible food marker. 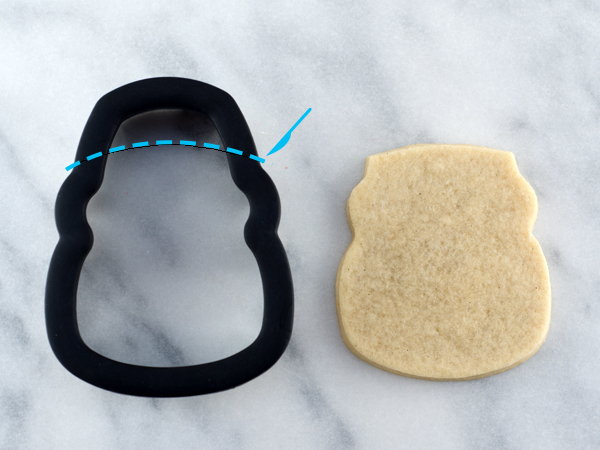 Begin by outlining an “eye” shape in the middle of the cookie with chocolate icing, as shown below. Then fill the section with chocolate flood icing. 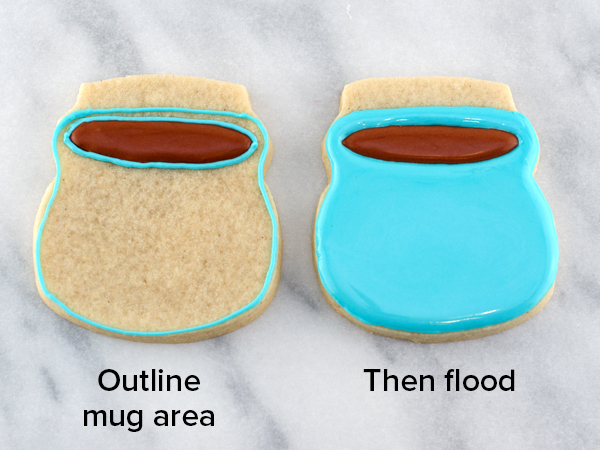 Next, outline the “mug” area with the blue piping icing. Then fill that area with blue flood icing. Give this icing time to dry (about 2 hours). After the mug area had time to dry, it’s time to add the marshmallows. Outline two marshmallow shapes with white piping icing. Then fill each section one at a time. 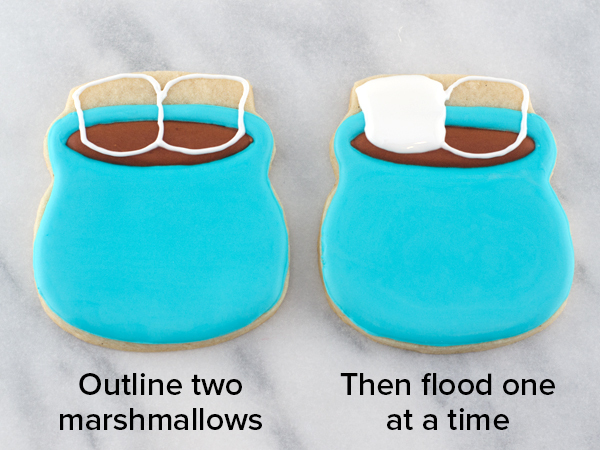 Let the icing set for about 15 minutes before filling in the second marshmallow. 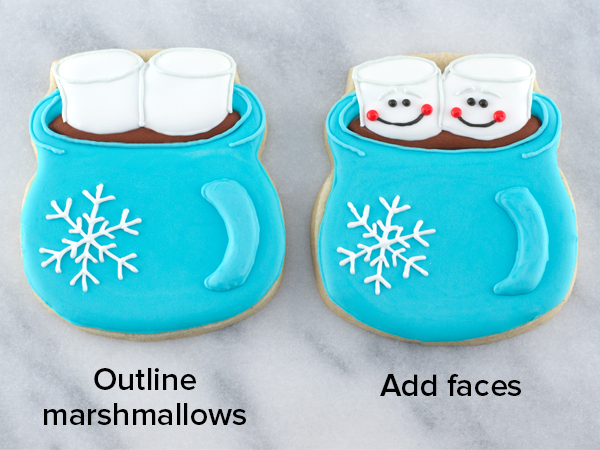 Once the marshmallows had time to set, add the mug details. Outline around the rim of the mug, and outline and fill a curved, mug handle off to the side. Then, with white piping icing, add a snowflake to the side of the mug. Lastly, add the final details on the marshmallows. I like to outline the white marshmallows with an off-white, light gray color to stand out more from the white marshmallow base. For the faces, add whatever facial details you see fit. I find eyebrows are always a nice touch. The finished hot chocolate mug cookies should look like the ones below. 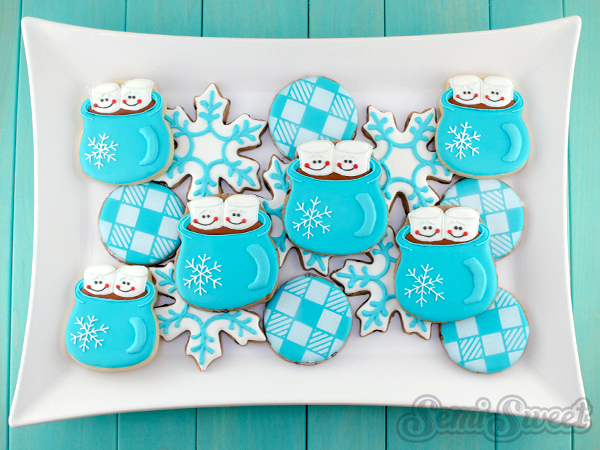 To compliment these wintery mug cookies, I included simple snowflakes and round, airbrushed cookies in a buffalo plaid pattern. I think the buffalo plaid adds a nice cozy feel to the set. 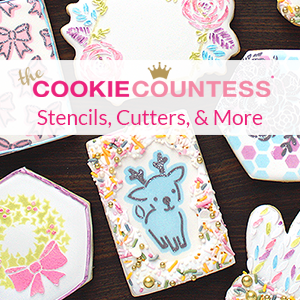 To airbrush on white coloring, I followed this guest tutorial by Sugared Hearts Bakery. Happy holidays and warm winter wishes, everyone! Adorable! Since I just got a “Hot Cocoa Hot Tub” inflatable for my outdoor yard decor, I was thinking of a cookie! Thank you very much! Love this! Oh my gosh, these are soooo super cute!!! I’m not a great decorator, but sure gonna give these a try!! Ah! Those are so cute! I love the roll outs with chips and marshmallows too, but could see why that wouldn’t be great for tutorials. Those are so cute! You make such cute cookies. 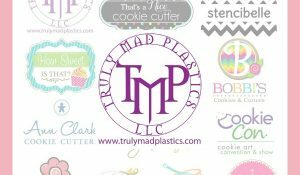 Love everything you make! Mike, you never cease to amaze me with your cookies! Love these! Another darling creation from your “Franken-cutter” brain, Mike! These just make me feel all warm and fuzzy! Hopefully they will be a can-do for this season. Blessings, Donna B. These are absolutely adorable! I must make these!!! You two are amazing! Another winner, Mike, with a very high cuteness factor! They’re adorable! I especially love the marshmallow and chocolate chip inclusions in the cookie dough! I want to rush into the kitchen for a cup of hot chocolate. These are adorable. Thanks for the tutorial. 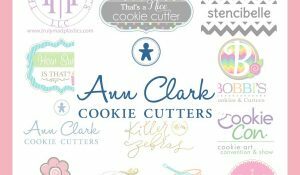 I adore this design and always love your cookies. So cute. I wish I could see more of your tutorials on YouTube, but understand how tedious those videos can be..
Pingback: 18 Fantasztikus karácsonyi sütemény, amikt?l meg?rül majd a család! 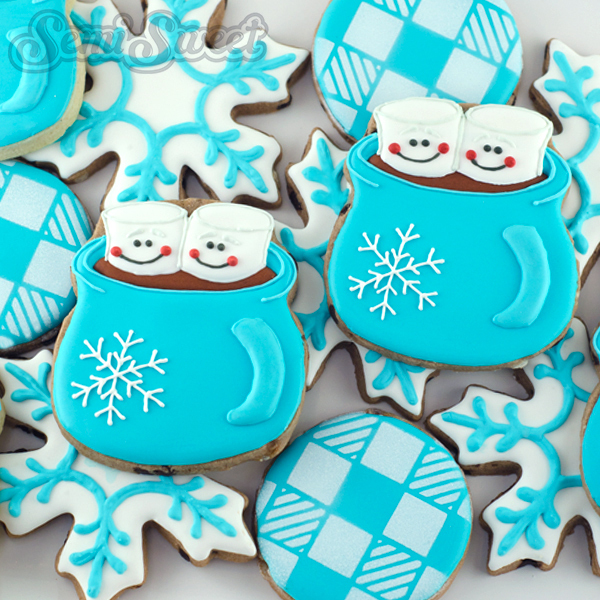 i love these cookies so cute i would love to give them a try would you say you found them easy to make. This is the right site for anyone who desires to learn about this topic. You recognize so much its almost hard to argue with you (not that I really would want… HaHa). You definitely put a new spin on a subject thats been written about for years. Fantastic stuff, just amazing! The article has really peaks my interest. I’m going to bookmark your site and keep checking for new tips. Great looking site. Assume you d?d ? bunch of you? v?ry own html coding. Thank you for sharing a very useful article . I like it very much. Feel free to surf to my web-site. I made these tonight and they taste soooo good! 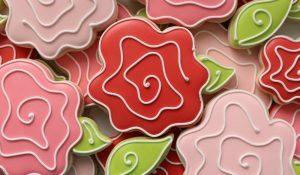 Do you use regular royal icing or flavor it with something ? I’m scared it will take away the awesome flavor of the cookie. I think just a smidge of clear vanilla will be the perfect compliment!